Given the historic unpopularity of Donald Trump, one would expect Democrats to be gleefully critical of the new president-elect. And certainly, many of them are, especially when it comes to denouncing his divisive and offensive rhetoric. However, none other than progressive hero Bernie Sanders has recently pledged to work with Trump. And he's not alone. Despite the distastefulness of Trump (well-documented by both sides), his economic policies actually overlap in many instances with traditionally Democratic views. And the failure of Hillary Clinton's campaign to recognize the economic anxieties of working-class voters is what some blame as the Achilles heel of her presidential run. In that arena, Sanders is ready to play ball with Trump. Anyone who followed Sanders' campaign will know that his go-to topic was income inequality. No one spoke out more regularly about the widening gap between the one percent and the middle and lower classes. In remarks at George Washington University on Nov. 16, Sanders posited that most Trump voters are not racist, sexist, homophobic, or otherwise phobic-afflicted. Rather, he argued that millions of working-class voters were worried about their future and the prospects for their children, and out of desperation (and disappointment with being abandoned by Democrats), they decided to give Trump a chance. And Sanders is not alone in his assessment. Even during Hillary Clinton's run, Bill Clinton advised that she spend more time in rural and rust belt areas, speaking to the white working class voters who had helped him win two presidential terms. In meetings, Bill voiced his desire to fight for working-class white voters, but his wishes were dismissed pretty much out of hand. The strategy instead focused on mobilizing the so-called "Obama coalition," which exit polls suggest did not show up for Clinton the way they did for President Obama. Clinton underperformed among African-American, Latino, and younger voters, which played a role in her loss. But she also lost white working class voters who had twice voted for Obama. As The Washington Post reported, "Of the nearly 700 counties that twice sent Obama to the White House, a stunning one-third flipped to support Trump." Many of these counties are located across the industrial Midwest, covering swaths of Michigan, Wisconsin, Iowa, Minnesota, and Illinois. And Bill was not the only one to worry that these historically Democratic voters were being ignored at great peril. The liberal documentarian Michael Moore voiced his own pre-election concern that Trump was going to win. Moore hails from Michigan, and spoke candidly about the plight of auto workers in his home state, and their respect toward Trump for standing up to the factory executives. In fact, on many economic issues, Sanders and Trump are more in agreement with each other than fellow members of their respective parties. For instance, both Sanders and Trump want to raise the minimum wage, which Republicans usually argue against. 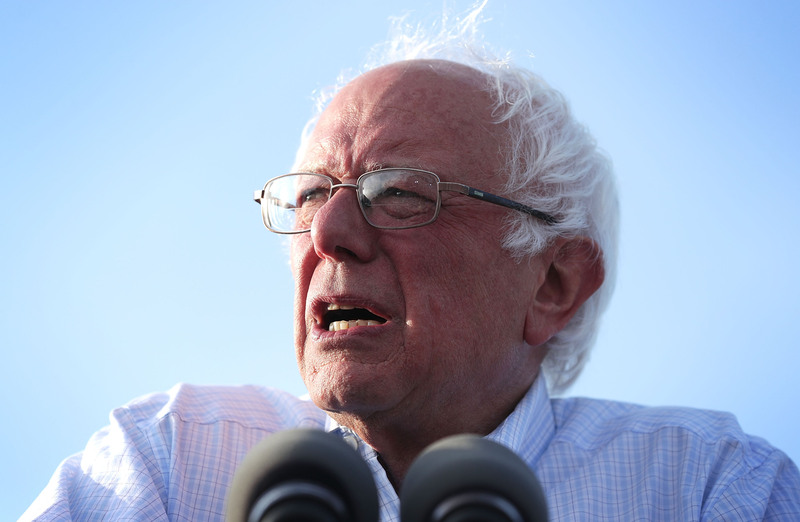 Sanders and Trump are also in favor of renegotiating or eliminating trade deals, which the "Establishment" within Democratic and Republican circles are usually all for (the Trans Pacific Partnership was put together by Obama). And while Sanders does not echo Trump's offensive rhetoric on immigration, he certainly is in favor of bringing jobs back to depressed communities. Many Trump voters felt that they had lost employment to undocumented workers who would agree to lower wages. They also expressed frustration and "rage" at feeling constantly misunderstood. So when it comes to fighting for the "forgotten" working class, Sanders is ready to work with Trump. But he offered his cooperation with a word of warning, saying "We are not going backwards in terms of bigotry, we are going to go forward in creating a non-discriminatory society." One hopes Trump heeds these words, and amends his behavior accordingly.